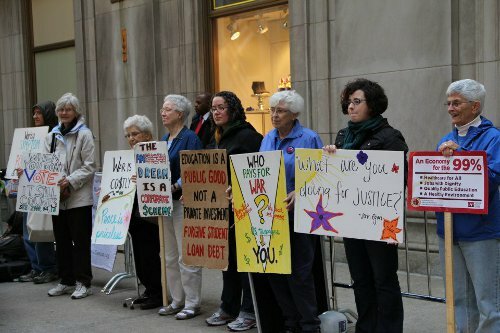 Photo: From far right: 8th Day staff members Kathleen Desautels, SP, Mary Ellen Madden, Staff for BVMs, Gwen Farry, BVM, Liz Deligio, Staff for FSPAs, Joellen McCarthy, BVM and 8th Day Associate, Barbara Corcoran join other activists at Occupy Chicago this past October. Photo courtesy of Angie Connolly, Sisters of Charity, BVM. Learn more about the 8th Day Center and their work for social justice, including their exploration of the issues fueling the Occupy Wall Street movement.